James Farquhar is often referred to as “Mr. Nova,” as the university may not have survived without him. Soon after moving to Davie, Florida, in 1945, the Farquhar family purchased thousands of acres on which they grew sod. According to a Sun Sentinel article published in 1997 following his death, James Farquhar donated 100 acres to the budding university, a gift whose value exceeded $500,000. In 1969, the university was faced with the possibility of having to close its doors, so Farquhar donated $750,000 (Sun Sentinel, 1979). The Farquhar family independently donated 15 to 25 million dollars to NSU during and after James Farquhar's life (Sun-Tattler, 1979). Former NSU President Abraham Fischler explained, “James Farquhar served for 10 years in the most difficult 10 years the university ever had. On many occasions, he put up his own land as collateral [for the university] to borrow money” (Sun Sentinel, 1997). 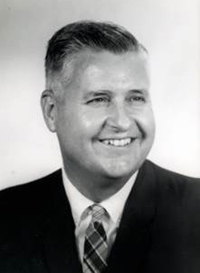 President emeritus Ovid Lewis fondly remarked that James Farquhar saw NSU as his “baby” (Miami Herald, 1997). Farquhar served as chairman of the board of trustees for both the South Florida Education Center (SFEC) and Nova University of Advanced Technology. He served on Nova’s board until 1976.